This 2-hour thriller claiming to be a taut revisionist version of the 1969 classic produced by this film’s director’s father and directed by his uncle, actually seems to last much longer than its playing-time. Ittefaq is one long stretch and a yawn. Unlike the origina,l the action in the remake jumps all over the place like a frog during the mating season. The characters run around a lot. But we are never interested in where they are going, or whom they were trying to bump off and why. This is not a whodunit. This is a whocareswhodunit disguised as a whodunit. And the real murder victim is the original film’s script. Yash Chopra’s Ittefaq has been mauled and moulded into shapes that the original creators never intended. The real murder happens not in the film but during the scripting sessions where someone must have had the bright idea of re-doing Ittefaq because…what the f..k… it’s less costly, more safe than doing an original. So in the original we had Rajesh Khanna as a painter accused of killing his wife, and Nanda, in an image volte face, a woman who murders her own husband. The painter is converted into best seller writer named Vikram Sethi. As played by Siddharth Malhotra, he is anything but a suitable boy. In the new version of the original there are twists galore…oh yes, so many twists that at one point I wanted to jump out of my seat and burst into R D Burman’s ‘Aao Twist Karen’. But I held my peace. In the hope that Abhay Chopra and his co-writers Shreyas Jain and Nikhil Mehrotra would finally make peace with the original. But no. Till the end, the new Ittefaq remains an atrocious atrophied piece of sleuthing travesty littered with incriminating remnants of a glorious past when content was Queen and Rajesh Khanna was king. The neo-Ittefaq fails on both counts. The plot is subverted and turned around so neatly that the ‘shock’ ending will shock only those who have never watched any episodes of CID. 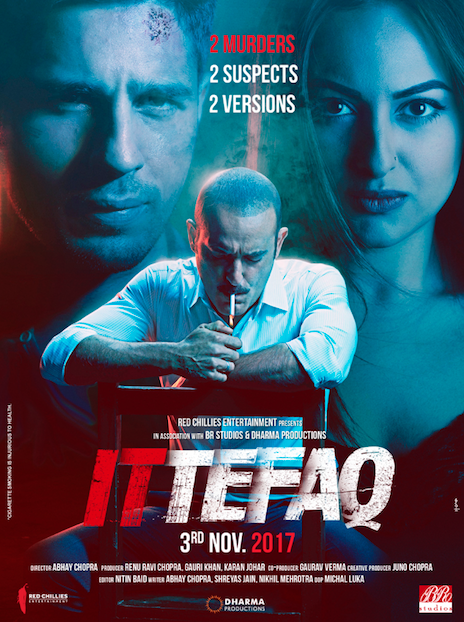 Ittefaq attempts to be clever but ends up tripping over its own cleverness. The two protagonists are played at a feverish pitch of self-obsession. Both Siddharth Malhotra and Sonakshi Sinha want to be captured in the best light possible. To their good fortune cinematographer Michal Luka lights up the night life of the characters’ elitist lifestyle in magical mystical ways, tricks that belong to some of other film. Here the gorgeous lighting only spotlights the emptiness of a script that’s denuded of empathy and protagonists who are stripped of all their magnetism. Siddharth Malhotra and Sonakshi Sinha try hard to fill the original shoes. Malhotra even has a ‘showreel’ sequence in prison—you know that footage that they play when an actors is nominated for an award– where he sobs over a plate of terrible prison food. The third protagonist, a wry cop played with rigorousrelish by Akshaye Khanna tries to hold the film’s glaring, blinding flaws away from the light. But Ittefaq, I am afraid, stands exposed as one of the hollowest remakes of Indian cinema. Incidentally the cop has a seemingly interesting family life with Mandira Bedi playing his delectably teasing wife. I would have preferred to see a film about the cop’s family rather than the two posturing fugitives. Either could be the killer (not that anyone cares). Either way it is the audiences’ patience and faith that die a painful death as a 2-hour film plods on to seem like a eternal punishment meted out to all fans of suspense thrillers. There are points where the narrative comes awake from its dormant condition… Only to lie back and snooze all over again as director Chopra piles the atrocious plot manoeuvrings with preposterous paddings, like cops who joke about murder and victims’ corpses, and a cop who discusses vital clues of a murder case over the potty. All good taste gets flushed down the toilet. There should be laws against relatives of artistes vandalizing the movie classics. Imagine if Shah Jahan’s grandchildren decided to add extra rooms into the Taj Mahal. Or if Leonardo da Vinci’s grandchildren decided to turn that eternal smile on Mona Lisa’s face into a frown…That’s what Ittefaq makes you feel. The real suspense, if you ask me, is why are Shah Rukh Khan and Ranbir Kapoor thanked in the opening credits? Maybe for sitting through the film and actually laughing at the cops’ jokes about crime and punishment, and for not laughing when Sonakshi tells Malhotra, “I wish my husband was like you.” This has got to be the worst pass ever made by a female actor to her co-star. Do yourself a favour. Don’t watch this pale inert uninvolving remake. Watch the original. And see why Rajesh Khanna was the greatest star-actor ever. 16 queries in 0.541 seconds.